SOHO — A street vendor who was stabbed in the chest and then chased down his attacker will be recognized for his bravery at the upcoming Vendy Awards on Governors Island. Baare Batchiri, 60, was selling cell phones at his table outside 590 Broadway on June 23 when he was approached from behind and attacked from with scissors by Richard Pearson, long known as the "Wild Man of SoHo" because of his reputation for violent outbursts in the neighborhood. 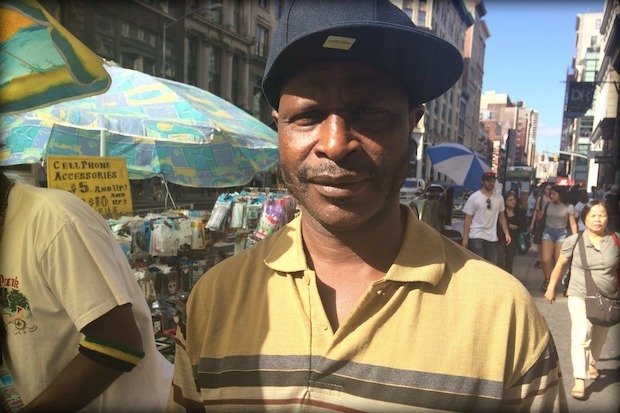 The Street Vendor Project decided to give Batchiri the "Heroic Vendor Award" at this year's Vendys because of the courageous way he responded to the attack. Even though he was bleeding from the scissor wounds in his chest and side, Batchiri chased Pearson into the nearby Broadway-Lafayette subway station and helped police capture him. "Baare has been able to overcome this attack, keep an open heart and mind, and continues to serve his community," said Sean Basinski, director of the Street Vendor Project. "For that, we are proud to present him the Heroic Vendor Award at this year's Vendys." In previous years, the award has gone to the street vendor who spotted the Times Square car bomb and reported it to police, a Bay Ridge halal cart vendor who stood up to neighborhood businesses trying to force him out and an association of about four dozen food truck vendors who helped serve meals after Hurricane Sandy. "I was so surprised," Batchiri said of the Vendy award, smiling widely as he worked at his table on Broadway on a recent afternoon. "I'm so happy. It feels really good." After Batchiri alerted two nearby police officers and led them to Pearson, the officers tried to get him to sit down in the Broadway-Lafayette station to wait for medical attention, but Batchiri wanted to return to the table he'd left unattended, he recalled. It was only once he was back on the street that the effects of the massive amount of blood he had lost hit him. "Everything was spinning," Batchiri said. Batchiri, a Brooklyn resident who is originally from Niger, ultimately needed a blood transfusion and had to stay in the hospital for 10 days. His co-worker, 54-year-old Bernard Thompson, said Batchiri struggled emotionally for the first two weeks after he came back to work. He still gets jumpy if people approach him from behind, and he occasionally has panic attacks. "He has his good days and he has his bad days," Thompson said. Batchiri agreed that the attack had left him shaken, and he worries about Pearson being released from jail. He also still hasn't fully recuperated physically. Just last week he spent a morning in the hospital trying to get treatment for chest spasms that keep him awake at night and occasionally cause shooting pain during the day. He was given a prescription for the pain. Before the attack, Batchiri often walked past Pearson, who is homeless, begging on the street, and frequently gave him a dollar or some food. "[Batchiri] is the last person we thought [Pearson] would harm," Thompson said. Pearson is facing attempted murder charges in New York Supreme Court and is being held without bail. His next appearance in court will be on Sept. 24. The Vendy Awards are part of a day-long festival with food trucks, games and prizes, all organized by the Urban Justice Center to raise funds for the Street Vendor Project. For the 10th anniversary this year, they are bringing back the Vendy Cup winners from previous years — including NY Dosas, the Greenwich Village favorite from Washington Square Park — to participate in a Masters Cup. This year's Vendy Awards will take place on Sept. 13 from 12:30 p.m. to 5 p.m. on Governors Island. Tickets are available online.